The Marina Bay circuit has become something of a title predictor; in 7 out of the last 8 seasons, the driver who won in Singapore has won the title. The Singapore skyline at night…. The track is a twisty, bumpy affair and most of it runs close to a wall. It is difficult to overtake and tough on the brakes. Qualifying here is very important. If you can conquer the Marina Bay Street Circuit you can probably achieve anything…. Chase Carey, the new Formula 1 chairman was witness tonight to a spectacular race: “There is a great show going on. You saw Formula One at its best today” (Toto Wolff). 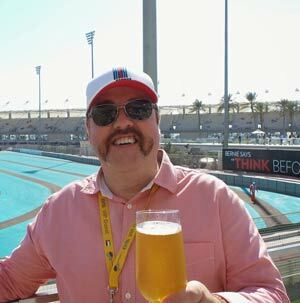 Carey brings with him a new hope for the future of the sport; as he is keen to take F1 to the huge ‘untapped audience’ in the US. Mercedes had been very poor at Marina Bay last season. Rosberg had been forced to change his power unit on coming to Singapore last year (following an engine failure on Lap 50 at the Italian Grand Prix). He eventually managed to come 4th whereas Hamilton had to retire on Lap 32 – also due to a power unit issue. This year Mercedes took 2 podium places with Rosberg 1st and Hamilton 3rd – not too shabby… Today their ‘problems’ were mainly with the brakes, neither does the F1 W07 work at its best in dirty air. Rosberg handled these issues seemingly effortlessly, but Hamilton’s race was a bit of a self-proclaimed ‘nightmare,’ “My brakes were overheating so I had to slow down.” (Hamilton) A podium place is hardly a nightmare, but perhaps it refers more to Hamilton’s grip slipping on the World Championship – while his team mate finds his form. So the battle for the 3rd podium place was firmly between Raikkonen and Hamilton. Raikkonen passed Hamilton following a mistake by the British driver at Turn 7. After pit stops left Hamilton in 4th, he pleaded over the radio for engineers to help him gain places. Mercedes’ decision to change to a 3 stop strategy gave Hamilton a chance to close in on Raikkonen, whilst not worrying about saving his tyres. It was this that put him ahead of Raikkonen, following his final pit on Lap 45 – and onto the podium. Raikkonen had been 6 seconds ahead of Hamilton when he pitted for the final time, but eventually had to leave without a podium place – settling for 4th. So Ferrari had a good day; capitalizing on their success at Monza and taking 4th and 5th places. Sebastian Vettel also had an excellent race; starting from the back of the grid after receiving a grid penalty for extra parts – following a broken right suspension in qualifying. Ferrari took advantage of this situation, fitting new power unit components and a new gearbox – thus absorbing the pointless penalty points. A 2 stop strategy, on ultra softs, Marina Bay specialist Vettel ultimately achieved 5th place. Another battle was between rivals Toro Rosso’s Daniil Kvyat and Red Bull’s Max Verstappen; with the Dutch man being pushed close to the wall on a couple of occasions – causing him to complain over the radio. Red Bull’s decision to pit Verstappen to solve this, by giving him clear air and exploiting his pace – put him ahead of Kvyat and he finished 6th. Button never really got going and was forced to retire in Lap 43 – after spending most of the race struggling with poor grip. City of Singapore with the F1 racing track lit up by floodlights! Is Rosberg odds on for the Title? It is worth noting – as Rosberg takes his 8th win – that no driver has ever won 8 races in a season and not taken the title. It is his 3rd win in a row, putting him 8 points ahead – this seems like a good time to peak. Can ‘Mr Cool’ keep his composure and become World Champion for the first time? Rosberg looks unstoppable, but he has been here before… One thing is for sure – we are all in for a treat from now until the 27th November..
For more about the Singapore Grand Prix please see our information page or if you would like to go to this grand prix then we why not have a look at our hospitality packages on the event and give us a call on 01382 480077 and we would be more than happy to discuss your requirements.